This army was destroyed by the forces of Hanover King George II at the Battle of Culloden, Scotland on April 16, 1746. George's forces massacred as many survivors as they could find, forcing Mercer into exile as a result. He eventually made his way to the colony of Pennsylvania where he settled and resumed his medical practice. After the Continental Army was driven from New York and across New Jersey in the fall of 1776, they stopped their retreat on the Pennsylvania side of the Delaware River. Mercer is sometimes credited with coming up with the plan to attack the Hessian outpost at Trenton, which helped stem the discouraging tide of American losses. Washington's forces ferried across the river in the middle of the night on Christmas Day and captured 1,000 Hessians at the outpost. This led to another victory a week later when Washington repulsed a counterattack from Lt. General Charles Cornwallis at Trenton again. After that victory, Washington's men marched through the night toward Princeton to capture the British outpost there and continue its string of victories. 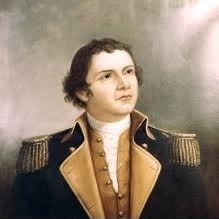 Hugh Mercer led an advance party of 1200 men that ran into a large British force at an orchard along the way and fighting began. 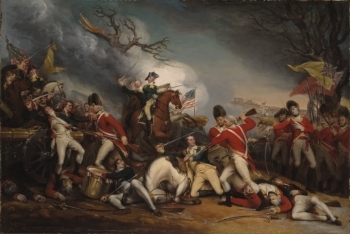 The British force quickly defeated the green American militia units and General Mercer was surrounded by British troops who mistook him for George Washington and demanded that he surrender. Mercer fiercely attacked his antagonizers, but was struck to the ground, bayoneted seven times and left for dead. He was attended by Declaration of Independence signer Doctor Benjamin Rush, but he died nine days later on January 12, 1777. He was buried at Christ Church in Philadelphia originally, but his body was reinterred at Laurel Hill Cemetery in 1840.